A couple of years ago, my husband got me the book Soul Contracts by Caroline Myss for my birthday. I read about the concept of our soul agreeing to a certain plan before we are born and it really resonated with me. Soon after I started reading about Robert Schwartz’s work in Cygnus Review and I felt very drawn to learning more. After a few months, I gave in to this inner voice pushing me and bought his book Soul’s Gift. These two books helped me realise that working with the soul was really important to me. A few months later I heard the Mantra for the soul on Deva Premal’s online meditation journey, and loved it. It reminded me of my Indian roots, the concept of the soul and rebirth that I have grown up with. I have been listening to this mantra quite regularly ever since. I find it especially helpful when I am feeling really unsettled or challenged. It can be very comforting to realise that the unsettling experience is simply helping me to become conscious of something that I need to be aware of. Apparently, part of our life purpose is to know ourselves and accept ourselves – not just the parts that we like, but especially the parts we may not like very much. I was at a QiGong weekend in 2014 with a friend. I happened to be next to her when one of the QiGong teachers there was giving her business card to my friend. Somehow I found myself asking for one too. Then something made me turn the card over and on the back I read the words – Soul Plan Readings. I remember feeling as if my whole being lit up when I saw the words Soul Plan. I asked her about it. When she mentioned that it was based on our birth name – again it was a huge YES for me as I had been feeling for a while that our birth names are quite significant. I had felt for a while that the names we are given is not pure chance, that there is more to it than we realise. 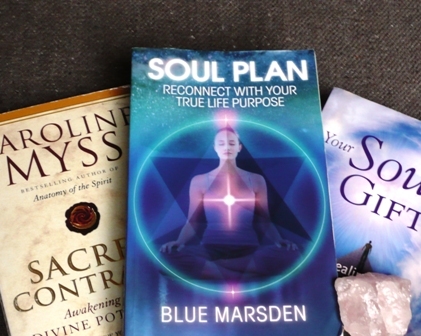 I learnt that Soul Plan Reading is based on an ancient system of life purpose analysis written about in a book by Blue Marsden. I bought the book and signed up for a Soul Plan reading (SPR) with Blue through a Skype call. The reading was a profound experience – very emotional– at times I wanted to sob my heart out. At a deep inner level I could really feel the truth of what I was hearing. It made me wonder about how someone could know so much about me without ever having met me! Some of what I heard in the SPR I had heard before in my astrology reading. Sometimes it seems as if I need to receive the same message twice or from two different sources before it can register. Maybe it is the Gemini energy in me – where both parts of me need to hear it! By the end of the reading I knew that I wanted to learn how to do SPRs. I spoke to Blue about it and booked a place on the course he was teaching in September 2014. The course was over three days. Like most healing modalities, the course was not just about learning this method but was a profoundly insightful and healing experience. On my way to the course, one morning, I saw a girl walking across the park, fiddling with her mobile phone, not seeing a root protruding from the ground and nearly tripping over it. This experience made me realise that the SPR helps us to be more aware of the obstacles in our path. When we are able to see the obstacles, hopefully we can navigate around them with more grace and ease, and are less likely to fall over. Better awareness also helps with acceptance of what is happening in my life. SPR does not just highlight the obstacles in our soul plan, but it helps us to see the gifts and strengths that we have, and how we can use these gifts to work through the challenges to achieve our goals. It helps me live my life in better alignment with my soul purpose and therefore feel more fulfilled and peaceful. Having better awareness of my Soul Plan has been a deeply healing experience. At times it seems to have been a catalyst for memories to surface, for connections to be made, for insights to surface and healing to take place. When I am struggling or feeling overwhelmed with life, remembering what my Soul gifts are and using them can help me to navigate the situation with more ease. When I am struggling with making a choice, it helps me to remember what my Soul Destiny is and making the choice in alignment with it. I used to worry so much about making the right choice but I have learnt that actually there is no right or wrong choice. It makes life so much easier to have realised that each choice I make simply helps shape the path my life takes. What I need is to be in the present moment and appreciate each moment as best as I can – enjoy it if possible. If it is not possible to enjoy it, I try to accept it for the gift, the strength and wisdom it is bringing my way. Looking at the Soul plan of people in my life has helped me to understand them better and therefore be more accepting of them as they are. I feel that we are in each other’s life for a reason – to help us move forward on the path of our soul purpose. My husband helped me see this so beautifully by getting me the book on Soul Contract for my birthday. Little did he realise at the time, the process he was helping kick start in my life! Mamta offers Soul Plan Reading. You can contact her on mamta@reikiwithmamta.com or 07782161477.